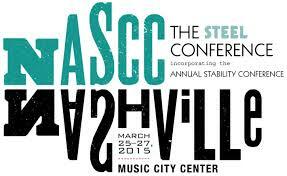 Chicago, May 20, 2015—If you missed the 2015 NASCC: The Steel Conference in Nashville (which attracted the conference’s highest attendance ever! ), AISC offers the next-best experience. The more than 100 recorded sessions from this year’s conference, which include a synchronization of the speakers’ voices along with their visual presentations, are now available for free online viewing at www.aisc.org/2015nascconline. You can find multimedia proceedings for conferences since 2008 by visiting www.aisc.org/freepubs and clicking on “Steel Conference Proceedings” in the left-hand menu. Mark your calendars! Next year’s Steel Conference will take place in Orlando, Fla., April 13-15, and will be held in conjunction with the World Steel Bridge Symposium. Registration for the conference will open on January 5, 2016 at www.aisc.org/nascc.